Dear Professional Colleague, Have you ever wanted to meet up with thousands of other Process Improvement, Change Managers, Project Management Leaders, Quality Management leaders, Lean & Six Sigma Professionals from around Nigeria and the world? LEAN SIX SIGMA & PROCESS IMPROVEMENT CONFERENCE delivers just that, inspiring and educating thousands each year. Not only will you learn the latest lean six sigma tactics, but you will also create the connections/network needed to transform your organization for the ever evolving competitive business world. 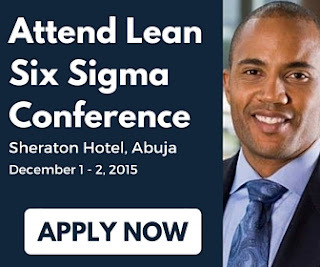 Join us from December 1st -2nd in Abuja, Nigeria for our largest LEAN SIX SIGMA event yet!! !